UC Davis, including the Jan Shrem and Maria Manetti Shrem Museum of Art, remain closed due to wildfire smoke. The museum is scheduled to reopen Tuesday, Nov. 20. Explore how artists think about space, especially in relation to bodies. How do we move through a filled space versus an empty one? How does the space under your bed feel different from the space in our lobby? How can we confuse the body’s sense of space? 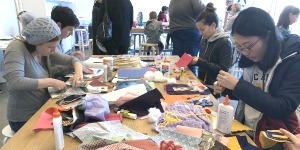 Experiment with installation art, architectural models, painting, wearable sculpture and more in these fun, drop-in sessions. in the Carol and Gerry Parker Art Studio as we explore materials and develop ideas inspired by the exhibitions in our galleries. Weekly challenges prompt you to think about why, what and how you make art, then get messy with hands-on experiences.